FC Bayern München will be determined to break a three-game winless streak in all competitions as they host PSV Eindhoven on Matchday 3 of the UEFA Champions League group stage on Wednesday (kick-off 20:45CEST/18:45GMT). Got space for Robben in your Official Fantasy Bundesliga team? Sign him up now! Bayern will be counting on the fit-again Arjen Robben to provide the spark as they entertain his former side at the Allianz Arena. Having made a perfect start under Carlo Ancelotti – with eight wins in eight – the Bavarians have stuttered in recent weeks, losing to Club Atletico de Madrid at the end of September and then failing to win back-to-back Bundesliga games for the first time since March. Robben's return has been one of the silver linings of that disappointing run. The flying Dutchman needed just seven minutes to get on the scoresheet as he came off the bench against Hertha Berlin, making his first Bundesliga appearance since March. After an injury-hit 2016, the 32-year-old has been feeling his way back to full fitness. He scored the opener against Eintracht Frankfurt on Saturday, even if Bayern ended up settling for a 2-2 draw. 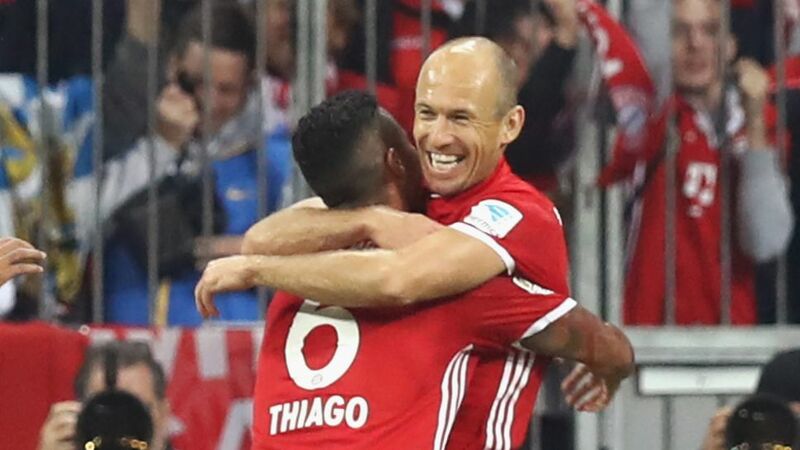 "I can't really be happy today, because we didn't have a good game," Robben said, after sharing the spoils with 10-man Frankfurt. "It wasn't the Bayern München everybody knows, and that's why we have a lot of things to improve." Watch: Robben frustrated after Bayern's draw in Frankfurt. Robben will be hoping to spearhead that improvement against his old club where he spent two full seasons, scoring 17 goals in 56 league appearances, before moving to Chelsea FC in 2004. With Franck Ribery currently sidelined by injury, there will be greater pressure on Robben to act as Bayern's creative outlet. PSV may not enjoy their trips to Germany - where they've won just once in 18 attempts - but since their last visit, a 2-0 loss to VfL Wolfsburg in October 2015, they haven't lost a competitive outing away from home. Robben was 15 and still making his way through the ranks at FC Groningen the last time these two sides met. Seventeen years on, with almost 100 Champions League games under his belt, he's out to prove that he still has what it takes to lead Bayern to more European glory.